The number one reason folks purchase candles is for the aroma and for this reason, fragrance oils for candles are the most important ingredient in the whole candle making process. Fragrancing is also one of the most complex and costly areas of candle making. Not only is fragrance oil for candle making the most expensive ingredient but it will also be the determining factor in whether or not your candles are a hit or a miss. When adding scented oil for candle making, you have two fragrance options available – natural or synthetic, each of which offer their own benefits. It is up to you to determine your ultimate goals, as well as whom your target market is, when deciding which fragrance option to use. If you choose to produce naturally scented candles, then you will be working with essential oils. Unlike synthetic fragrance oils, essential oils are naturally derived from plants and flowers. They are highly concentrated, and usually much stronger than most fragrance oils, so it can be easy to overuse them. Essential oils are also more costly than their synthetic counterparts. Typically, essential oils do not burn quite as well as synthetic oils, and are harder to blend with wax. While they can offer a very good scent throw, they tend to lose their scent faster than their synthetic counterparts making for a shorter shelf life. Because of their all-natural qualities, many natural wax candle makers find that essential oils are an excellent choice because their customers appreciate an all-natural product. Fragrance oil for candle making is man-made since they are synthetically produced by various perfumeries. For the best quality of fragrance oils for candles, it is strongly encouraged that you purchase them from a specialty candle making retailer. These suppliers usually seek high quality oils and the oils they carry are made specifically for candle making. Many candle supply retailers have their scents custom-blended. For this reason, a scent with the same name may smell very different when you buy it from various suppliers. Many retailers offer customer feedback and comments related to specific scents they sell. 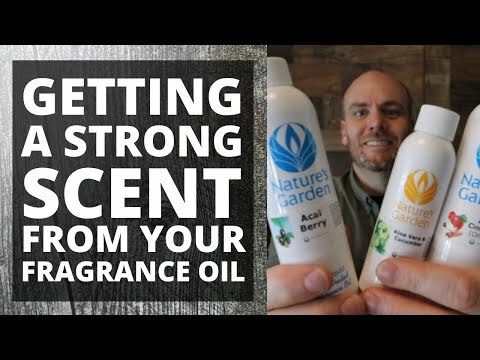 This information can help you determine what fragrances others are having success with and you may pick up tips on how they are successfully using the scent in their own products. There are literally thousands of fragrance oils for candles available, so using this type of information can help you narrow your options. When deciding on those you would like to try, many candle supply retailers will offer sample size containers of each scent so that you can try them economically before purchasing a larger size. When working with scents, consult the websites of the suppliers that sell your fragrance oils and wax since they usually offer a wealth of information. When you look up your wax instructions, there is typically information about the amount of fragrance to add for the best scent throw, and when during the candle making process it is best to add the fragrance for best results. A typical rule of thumb when adding oils for candles is one ounce of fragrance for each pound of wax. However, this is not a steadfast rule. Some candle makers choose to measure fragrance in teaspoons or percentages instead of ounces. Moreover, some waxes will hold more fragrance than others will. Each wax and fragrance is different, so plan on doing a lot of testing and trying many fragrance and wax combination’s before getting your best results. Also, remember to test for both cold and hot scent throw in your candles. There can be a big difference in how a candle smells sitting on the shelf compared to how it smells when it is burned. It is important that your candle smells great at first whiff when the jar is opened so that customers can experience the scent. It is even more important that the candle has great fragrance as it burns, as that is what brings your customers back for more.